Well guess that I will give you some more background after I showed of my new cage a few days ago. Im Mark and iguana is Bob. I am a junior as an Electrical Engineering major and have now had Bob for a little over 8 year. He is a little stunted from miscare early on and surgery a few years ago to remove a calcium deposit in his bladder. But over all he is the tamest iguana that I have ever worked with (he is the only one that I have ever owned) -- loves to ride on my shoulder whenever in an area he does not know (outside, the vet, ...) and it is not unheard of for me to wake up with on top of me in bed basking in the splash of sunlight. I don't know what I was thinking only having a tee shirt on when this pic was taken. Glad to hear that Bob found such a good guy to live with him. He had a rough start to life, huh? 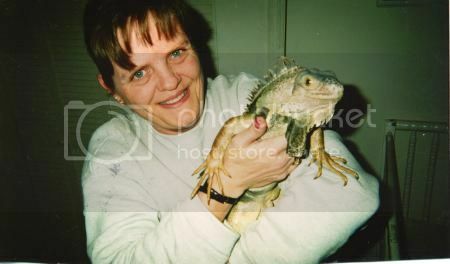 It makes me really happy when I hear folks that adopted or rescued Iguanas and helped give them better lives. Good for the two of you! Thanks for the pic. Bob looks like the picture of Iguana health. You however, seem a bit skinny. Is your diet correct? Just kidding. I couldn't help it! ;D Thanks for the Intro. Welcome Mark! Good to have you and Bob here. Welcome! Great photo of you both. I did not adopt Bob, I have to say that I bought him as a near hatchling out of one of the bins at Petland. Along with him I bought a book on igs which I took to be the truth on how to keep and feed them. The feeding info in the book was not terrible but it was still bad. About 4 years ago his diet made a drastic shift to the MK salad, when I found the site, from romaine lettuce/broccoli stems/cauliflower/carrot/beet and other various stuff. I did not have UV on him, proper humidity levels, or proper hydration levels. His current diet is somewhere between the Ig-den diet and what I understand to be the MK salad. Quick UV question. 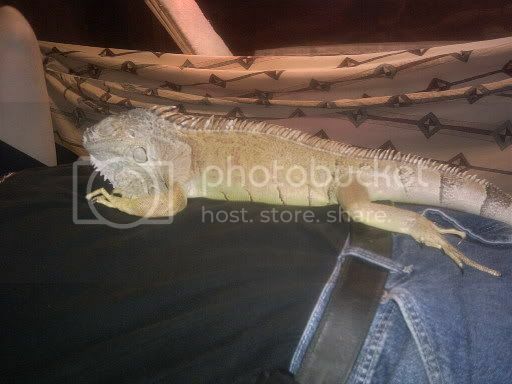 I now have a reptisun5 suspended in his cage to bask under -- see the fabric cage post for a pic. He will bask right under it if it is real low, then he stands up and hits his head on it. If I move it up so it is just above his head when standing he moves away, just out of it effective range. Should I have it raised so he really only gets 12" from it or should I continue to let him hit his head and back on it? It is suspended with string and the bulb with fixture weigh less than a 1/2 lb so I am not worried about pain. You are correct that the distance from the bulb to the Ig is critical for proper UVB absorbtion. I would suggest you enclose the bottom part of the fixture in a wire mesh "cage". reptisun bulbs are expensive and rather delicate. Constant hitting will only shorten the lifespan of the bulb. Bob is a very good looking guy. Glad to have you here. Enjoy the Zone. Debbie Iggy BAm-Bam and Miss Zak. Mark, I have to say Bob is HUGE and he looks GREAT!! WELCOME to the zone its a AWESOME GREAT place to be a part of and there is soooo much help here and knowledge its GREAT!! WELCOME again! !